The One World Institute has been generating ripples of positive, healing energy across the Pacific Ocean. Nowadays, if you know where to look, you can experience the magic and joy wheelchairs are bringing to those who cannot afford it, “wheelchairs of mercy” that can handle the urban and rural terrains of the Philippines, rain or shine. It’s been a very quiet humanitarian contribution to the Philippines’ “poorest of the poor.” Some of the visionaries just happen to be my friends: Dr. Tom Stern and Yolanda Stern. It’s time we share their work to my world! Tom and Yolanda Stern are a very interesting couple to spend time with, whenever we get that rare chance. Dynamic conversations are a norm. Tom really dances up a storm with Yolanda (with ease and grace!) during those ballroom-type parties. That’s just the social part — and trust that it’s not often that we even get to see them dance. I’ve personally been a part of strategic planning activities as well as political and cultural events wherein I’ve witnessed the couple’s foresight, dedication, accountability, and astute attention to details. 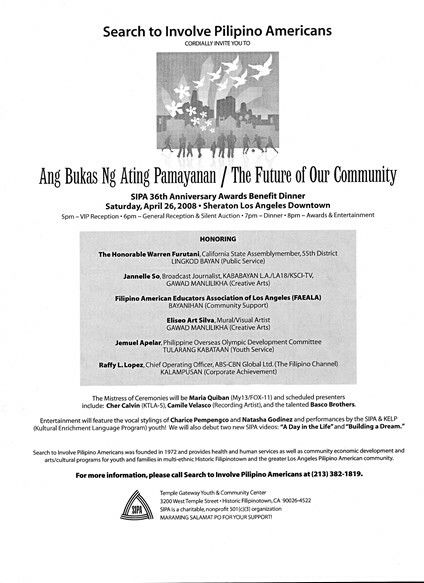 I really look forward to my volunteer work with them during collaborative Filipino community efforts. The stuff the Sterns are made of embody the qualities of loving-kindness and compassion. That’s my opinion. I believe that the Sterns truly enjoy their economic and cultural empowerment activities for the Filipinos in the Philippines and overseas. They are definitely “hands-on” humanitarians. Another personal item: I don’t even dare call “Manang Yo,” Yolanda’s nickname, on her cellphone because she might answer her phone calls from who-knows-where-in-the-mountains-of-Mindanao. In any case, I’m being considerate about unnecessarily contacting this beautiful couple by phone unless it is really urgent. Here’s what Tom and Yolanda have been up to. I hope the One World Institute gets more recognition, nationally or internationally, for its unheralded work that empowers disabled, economically-impoverished persons — soon!